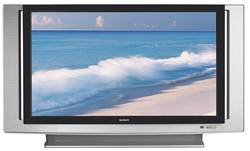 Here is yet another review of the Sony 60″ SXRD HDTV. This time up, the HTGuys. Here is HP’s latest offering in the 58″ DLP rear projection category. It uses the new “wobulation” technology, that I’m personally not quite sold on yet. It uses half of the pixels normally required to produce a 1080p image. With a mirror, the DLP chip reflects light to each half of the pixels in each frame, every 1/120th of a second. Sort of a “wobble” back and forth. It does have a better resolution than 1080i, and has less screen door effect, but I’m not sure it would stand up against true, native 1080p. I am immensely impressed with this model from HP. This is a great debut for a company previously known mainly for its computer products; HP hit the target from almost every direction. I could live happily with this set—if not ever after, at least until the next big jump in video display devices, whatever and whenever that may be. Wow, this JVC HD-ILA is one big, bad HDTV. A 70 inch rear projection set with 1920 x 1080p resolution (umm yeah that’s true HD), 2 HDMI inputs and great picture quality all for under $4400! •Picture memories not fully independent. It’s hard to sweat the small stuff when an HDTV performs as well as the JVC HD-70FH96. This giant HDTV manages to combine the high resolution of 1080p with most of the other characteristics that make a great-looking image. Its biggest shortcomings — a clunky user interface and the couple of missing features noted above — shouldn’t deter anybody who values picture quality above all else. If you’re looking for big rear-projection bling, this JVC could be your ticket. It’s interesting this award went to a 720p model. Remember, these are PC guys talking, so HTPC and other computer performance may have swayed them over dedicated home theater results. Still, worthy comments and sources. Rear projection sales were up 3% in October, even though there was a 2.7% drop in shipments. The average street price jumped 5.5% for the month, according to Rosemary Abowd, vice president of PMA. The key reason for this large increase was the dramatic growth in the proportion of sales coming from the 1080p resolution microdisplay-technology segment, which moved from 13% in August to 24% in September, and then jumped further to 32% in October, Abowd noted. It seems the numbers are a reflection of the shift to larger displays with newer technology, like the Sony SXRD units. These 2 models are the hottest and most popular rear projection sets available today. Excellent image quality coupled with the Sony brand makes these two HDTVs tough to beat. I’ve covered several reviews and lots of info about these units here, so I decided to consolidate everything to make it all very easy to find. Epson gets into the home theater game with two new LCD rear projection models, the 55 inch ELS-55GL1 and the 65 inch ELS-65GL1. The 65″ model should retail for a bit over $5800 and the 55″ unit should be around $5000 when they start shipping next month. More products means more competition which is always better for the consumer. I can’t help but wonder if Epson know what they’re getting into, though. In search of HDTV news today, I came across this entry about Sharp’s 65DR650 65-inch DLP rear projection HDTV at Costco. The writer mentions he found a $500 off deal at Costco, bringing the price down to $2500 which includes shipping. Not a bad deal at all, especially when you consider Costco’s customer service and gracious return policy. HP’s MD6580n, which took the Best of Show at the Digital Life Expo earlier last month, is under the gun at Cnet. There, she attains the Excellent score of 8.3 out of 10. This 65 inch masterpiece should be worthy of your interest, if you’re in the market for a 60 inch plus rear projection HDTV. The good: Accurate color temperature; excellent black-level performance; accepts 1080p sources via HDMI; ample jack pack accessible via front panel; thumbnail source selection feature. The bad: Nondefeatable edge enhancement; somewhat inaccurate primary colors; can’t fully resolve 1080p. The bottom line: While it doesn’t quite deliver the best picture among 1080p HDTVs, the HP MD6580n’s innovative design and future-ready inputs may tip the scales in its favor anyway. The Sony SXRD rear projection hdtv units are all the buzz right now, and it’s easy to understand. The big brand of Sony coupled with their image quality reputation makes for quick notice on the tech side. The high gain screen grain and perhaps some intrinsic noise are the only serious complaints I have about this set’s picture performance. That said, if you mostly watch DVDs on a good CRT based RPTV, I’m not sure you’d gain enough to make trading up to a set like this worthwhile. Right on, that’s what the buzz is all about – 60″ HDTV goodness at a fraction of the same-size plasma cost.